Understanding promise ring etiquette will help you know why a ring can symbolize so much feeling. It is a meaningful way to represent a promise you make with someone you love, yourself or with God. Back in the day a promise ring meant that a girl was going to be engaged within a reasonable amount of time. It meant that her heart was taken and she had promised herself to the man she loves. In the more modern times, a promise ring still can mean that and so much more. A promise ring is an outward symbol of a promise made. A promise that is worth keeping. I am sure that there would be many parents of teenagers that would not understand why their child is wearing a ring of this type. If it were me, I would automatically conclude that they have taken a relationship to the next level and I would begin to worry. It is not about that at all. Promise ring etiquette shows that these rings hold deeper meaning to the person who is wearing them. The ring in and of itself is an eternal circle, without a beginning or an end. A promise should be made and kept forever. The list could go on and on. 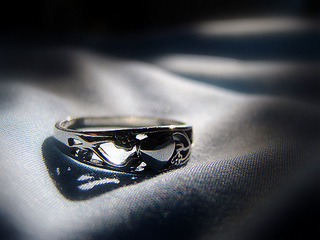 The important part to understanding promise ring etiquette is that it is something that the person wearing it or giving it has thought about and found a deep meaning in. When you are looking for a promise ring, it is good to remember that they are more simple in nature than, lets say, an engagement set. Because of this, you have so many more options to find something that is very meaningful to you. When I was promised to my husband, he was in the Northern part of France. He found me a simple silver band that had an inscription on the inside in the language of the area. It said, "Feal~Da~Viken" or faithful forever. I love that ring to this day. The uniqueness of it and the inscription have found a forever place in my heart. Promise ring etiquette shows that you are free to choose whatever style grabs your heart and fits the promise you are making. Birthstones are fabulous in promise rings. A popular thing to do is to have the promise engraved on the inside or outside of the ring. This brings the promise to light and will be a wonderful reminder of what you are working so hard to do. It is also nice that you can select a ring that will fit your budget as well. They do not need to cost a lot of money. The manner in which you wear your promise ring depends on the promise you are making. If you are making a promise of love to someone or God, then it is good promise ring etiquette to wear the ring on the left ring finger. However if your promise is more friendship or goal oriented in nature, then the proper place to wear the ring is on the right ring finger. In fact, you can wear the ring on any finger you choose, as long as it has meaning for you there. Sometimes people will wear the ring on a chain around their neck, and this is perfectly acceptable. If you have reached a place in your life where you want to share a promise ring with someone else, it is a good idea to talk about what the ring would mean to you and the other person. When you have found a wonderful person that you want to pledge your love to, you need to talk to them. Good dating etiquette is all about good communication. You want the other person to share your ideas of love and honor them. It is something that you can talk about in normal conversation. You will know how they feel and what their ideas and goal are if you ask them. When you have decided to move forward with a promise ring, it is not appropriate to give it to someone the same way you would ask them to marry you. Make it a simple, special moment. You could use birthdays and holidays as special times. Promise ring etiquette is about the meaning of the ring. Using this will help you understand why a ring is a beautiful symbol of a promise made.